After Call of Duty WW2 featured what looked like a German officer prominently in some concept art, there were questions about a playable Axis character in single player. 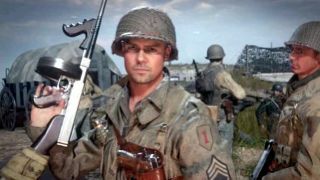 Obviously, there will be Axis characters in multiplayer but for a while developer Sledgehammer seemed to be skirting around the single player side of things. Even in the recent Making of Call of Duty WW2 livestream, creative director Bret Robbins dodged the issue - when asked if you could play as Axis in the story he replied "I can't really talk about it directly. Let's leave that one to mystery." That's pretty final then. Which seems odd after all that trying not to answer the question in the first place. Okay then - no playable Axis campaign, no forever sprinting and (maybe) no regenerating health this game. If you want to find out more, then here's everything we know about Call of Duty WW2. Plus we've also a big interview with Sledgehammer's Michael Condrey discussing Call of Duty WW2 in depth.